That’s so true. There is beauty in rainy days. And it helps to deal with the day by remembering that. So true. 🙂 Thank you Professor! [ Smiles ] That is an impressive snapshot of rain! [ Smiles ] You are welcome, Elina. Elina, this photo is another example of your uncanny ability to express beauty with the most refined and simple statement. Your welcome and really enjoy the photos. This shot communicates the exact feeling of the rainy moment. Nice! You have a wonderful eye for detail and beauty. Such a wonderful photo. Normally when I see droplets like that, it is the droplight that draws the eye. What’s interesting and lovely in this photo is how much the backdrop makes the photo. Love this! 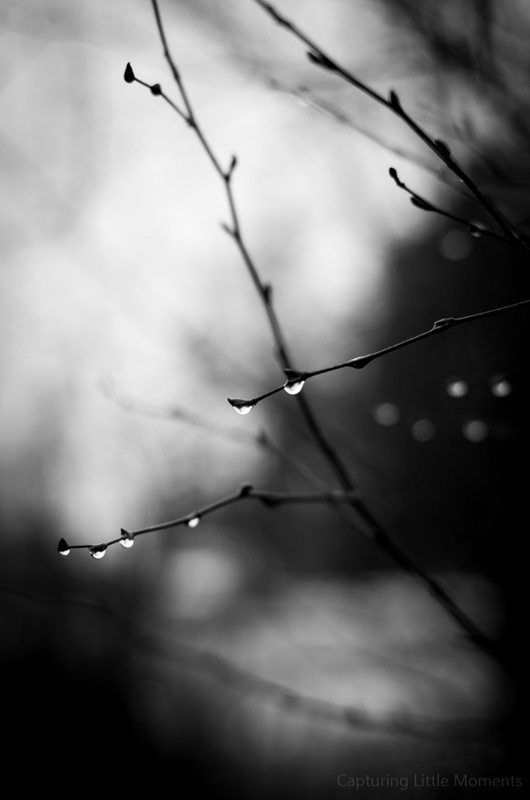 Elina, you truly have captured ‘rainy day beauty.’ It’s a restful and soothing picture. Thank you so much Wendy for such kind words! 🙂 Blessings! When watching this I feel … a glimpse of a carefree past. Again, love the simplicity of this shot! Gorgeous shot. I love the tones, the lines, the layers of focus – and I know it couldn’t have been easy, getting that razor-thin focal plane on the raindrops. This is the kind of shot that would do iosatel proud, I think. (And I see he really liked it, too 8^).